Services are scheduled at 10a.m. Friday, July 31, at Terpening & Son Chapel for Jose Luis Chavez of Artesia, New Mexico. 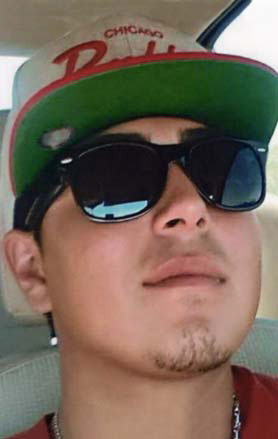 Mr. Chavez, 22, died Saturday, July 25, 2015 at University Medical Center in Lubbock, Texas. Rev. Avalardo Bolanos will officiate at the services with burial at Woodbine Cemetery. Pallbearers will be Jose Ortega, Luis Ortega, Julio Baeza, Miguel Amaya, Alberto Pena, and Salvador Saiz. Visitation will be at Terpening & Son Mortuary Thursday beginning at 2 p.m.
Chavez. He was a lifelong Artesia resident. He was a roustabout and of the Catholic denomination. Jose loved life. He enjoyed spending time with his friends and family and listening to music. Survivors include his parents Luis Chavez and wife Maribel of Artesia, and Elvira Ortega and husband Jose of Artesia; brothers Fabian C. Chavez, and Sabastian C. Chavez both of Artesia; sisters Liliana C.
Chavez, Sandra C. Chavez, Sonia C Chavez, and Barbarita C. Chavez all of Artesia; nephew Jose Luis Lopez of Artesia; and grandmothers Jessie Gutierrez of Artesia, and Celestina Heredia of Presidio, Texas; and a host of aunts, uncles, cousins, and friends. Jose was preceded in death by his grandfathers.